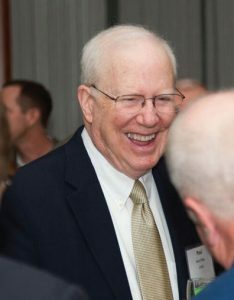 American Fiber Manufacturers Association (AFMA) President Paul T. O’Day recently passed away. Fiercely dedicated to the industry he loved, Paul led AFMA from 1984 to 2017 with a sophisticated wit and a powerful intellect. He was a true gentleman, always gracious and emphatically willing to help others; and his dedication and extraordinary contribution to the industry has been recognized by industry leaders from the United States and across the globe. “Paul was not only a great man, but he was also a friend and confidant to so many of us in the industry,” said Mark J. Ruday, AFMA chairman, and senior vice president, Fibers, DAK Americas LLC. The AFMA staff would like to thank Paul for his guidance and wisdom, for his strength and tenacity and for the honor and privilege of his leadership and friendship. Paul inspired us all and will be fondly remembered always.